OMEGA™ strain gage rosettes are available in a variety of different models to cover most strain measurement applications. The rugged construction and flexibility make these general purpose strain gages suitable for static and dynamic measurement with a high degree of accuracy. The measuring grid is formed by etching Constantan foil, which is then completely sealed in a carrier medium composed of polyimide film. 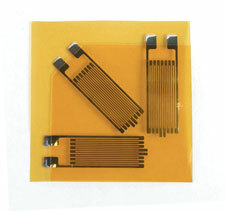 Either ribbon leads or solder pad termination style strain gages are available. Standard strain gages have temperature coefficients matched to either steel of aluminum.